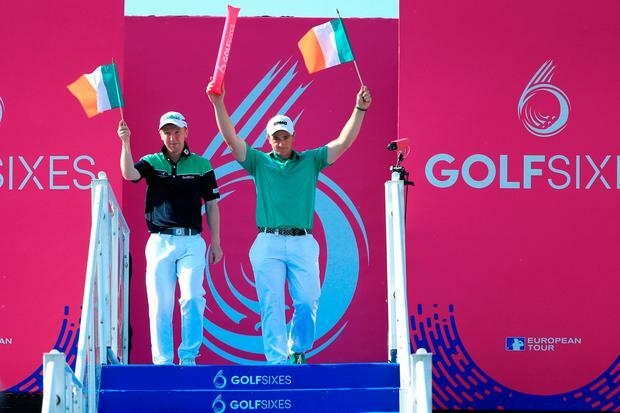 Ireland's Gavin Moynihan almost doubled his career earnings on the European Tour for two days' work after partnering Paul Dunne to victory in the second edition of GolfSixes. Moynihan, 23, who has not made a halfway cut in eight events this season, chipped in for a birdie on the first play-off hole to secure victory over South Korea in the semi-finals. And the Irish pair then defeated France's Romain Wattel and Mike Lorenzo-Vera 2-0 in the final at Centurion Club to secure the first prize of 100,000 euros each. Moynihan, who played on two Walker Cup sides, had previously earned 128,000 euros on Tour, the vast majority coming from a tie for 14th in last year's Irish Open. Ireland had earlier beaten the England Women's team of Charley Hull and Georgia Hall 2-0 in the quarter-finals, while the European Women's team of Mel Reid and Carlota Ciganda lost by the same score to Australia. But the fact that both teams, rank outsiders before the start, advanced from the group stages was an achievement in itself and a welcome boost for the women's game in Europe. "I think it's a huge success for women's golf," Reid said. "Hopefully we've opened a few more eyes to women's golf and shown that we can compete and that we are pretty good at what we do, and we work very hard at what we do. "Also, I wanted to point out that loads of the girls in America have been saying how much they have enjoyed watching it and Lydia Ko has already messaged us saying she's absolutely desperate to get on a team next year. "I really felt we could have done something very, very special here. I feel like we have, but I'm just a bit gutted that we haven't at least got through to the semi-finals."